Back in January I highlighted a major risk that the Council was ruining the Drury growth area by preferring the position of a few landowners over years of previous technical analysis and common sense. Key to my concern was the location of train stations to serve the southern greenfield growth area – the largest area of sprawl currently being planned, but also an area with a train line running right through the middle of it. In particular, at the time it seemed as though the Council was leaning towards preferring a centre as “location D” in the map below (and putting a train station next to it) rather than the much more logical “location E”. 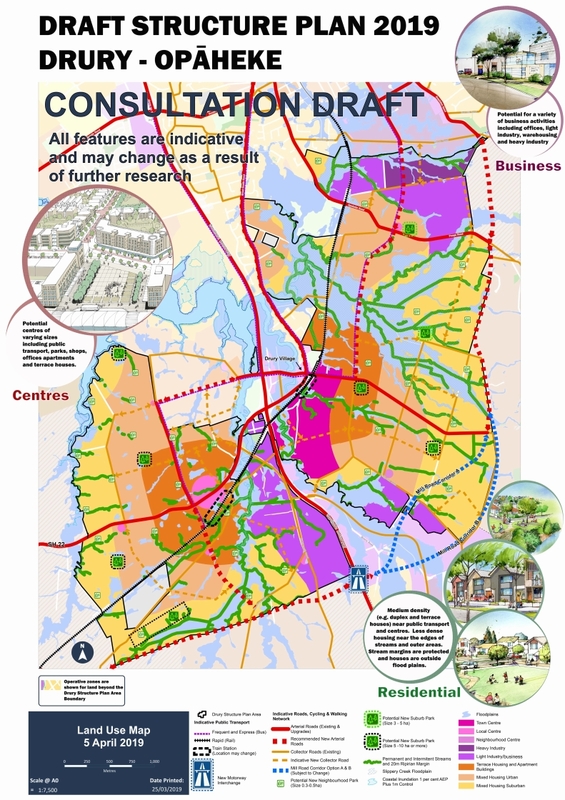 Last week the next phase of planning for Drury (and other southern growth areas) kicked off, with the publication of a full draft Structure Plan which refines the above map a bit further. Firstly though, as ratepayers e don’t want the council wasting money but surely a graphic designer wouldn’t be too much of a stretch for an important consultation like this. There are a few important changes from the map above that are particularly relevant to the train station location question. The two smaller centres of D and E have become a single centre halfway between those two. I’m pleased that at least this is now a bit further away from the motorway interchange. The future zoning is more defined as opposed to being more theoretical in the map above. While this plan certainly isn’t as bad as putting the centre and station at “location D” in the earlier map (which would have been entirely in a flood plain!) this still isn’t a great outcome. If you look at the map above you can see that, particularly at the northern end of the station sausage, a huge part of the train station’s ‘walk up catchment’ to its south and east would still that floodplain and beyond that industrial land. This means that much of the precious land around the train station actually won’t be able to be developed at all, and a much greater proportion of this area’s future population will live beyond easy walking distance of the Drury West station. Depending on exactly where the stations are sited, they could also remain fairly close together which isn’t as ideal from an operational perspective. Further issues are highlighted in a transport map from the Integrated Transport Assessment that supports the structure plan. On the bright side, the map seems to indicate the train station will be located right next to what will be an important north-south road for buses. This transport map from the consultation also indicates these will likely be frequent bus routes. But doing that that will mean the station is further disconnected from the centre. Surely a much more sensible way of sequencing development would be to start in the northeast next to existing Papakura and then work your way south and west over time as infrastructure and other services are rolled out? While there is a Special Housing Area already approved in the northeast part of Drury West, this never made any sense from a logical sequencing sense and further prioritising that area just seems like throwing good money after bad. At the very least, the sequencing should be aligned with completion of Pukekohe rail electrification – which could potentially be staged to first be extended to Drury East station before continuing south to Pukekohe. Overall it seems that the Council just haven’t quite got the structure plan right yet. With so much “draft” and “indicative” text all over the maps and still significant uncertainty in the location of critical components of the structure plan – like the Drury West train station – it looks like the Council has perhaps over-complicated the issue by trying to please too many different stakeholders and landowners. It should instead focus on what delivers the best long-term outcome for Auckland. The good news though is that the plan is still only a draft and probably only needs a few fairly minor (but important) tweaks to get right. So make sure you have your say on it between now and April 30th. Good post. Seems weird that Auckland Council gets so close to the obvious answer but then can’t quite bring itself to come up with the no brainer option. Because they need to tell a certain former mayor who advocates for a certain development down there to pull their heads in and let the Structure Planning take its natural path. Were is the 1000 car park and ride going to be. I would imagine people wanting to drive in from all around. They can provide a park and ride, or they can provide a liveable township. The requirements for a sustainable township suitable for the 21st century require excellent active mode infrastructure, excellent bus and train connections, and people-friendly land use planning. A park and ride is not part of that. I’d like to see the actual layout of streets, cycleways, parks, plazas. You don’t want to blot them out around the station and in the town centre with a park and ride, reducing the access of the people using sustainable modes. Park and ride would negatively affect the very way the whole township works, and the subsidy per park includes not just the land and cost involved in setting it up, but the prevention of a good outcome. If the people in outlying areas need a park and ride, they could perhaps pay for it at another station, where they are charged the full costs of providing that station… or maybe at a location in the middle of farmland, away from zoning allowing amenities bar a coffee shop, with a frequent connector bus to the station. I thought I would get a bite all good stuff Heidi. Good idea about another station for park and ride. If you go to Oxford they have a station called Dicot Parkway close by which seems to fill this function. A lot of passenger who would drive to Dury could be picked up by running trains on the Glenbrook branch put the park and ride near the mill on a bit of a spur. Also trains to Mercer with Tuakau and Pokeno being the major stations. Go to Mercer for operational reasons. Seems to be a mistake in the maps. The dotted red lines say they are ‘Recommended New Arterial Roads’ when it is supposed to say ‘Arterial Roads In Sheep’s Clothing’. At least the motorway got changed from a pastel peach dashed line – which looked awfully temporary and flexible – into a solid red line. Now everything seems to be political and decided based on how popular a project might make the elected people. Today’s example in the Herald is the Government saying if they cant afford two light rail lines then they will build the airport one and not the Northwestern. Despite the facts that the airport one requires shops to be destroyed on Dominion Rd, it goes parallel to SH20 which has plenty of capacity at peaks, doesn’t serve a growth area and will be used largely by people who currently already use a bus. On the other hand the Northwestern route serves a bunch of growth areas, is parallel to SH16 which is full at peaks and has the potential to get people out of cars. The politicians look at all that and know the public will all think that maybe one day they might ride on the airport route so they support that option. Why do you keep saying shops need to be destroyed for Dom Rd LR Miff? That’s absolutely not necessary and not in the plans as far as I’m aware. Unless someone has changed things to keep traffic lanes everywhere (which would defeat half the purpose…)? Have you seen recent plans? -tick in the designations box and zoom into Dominion Road and look for 1614 in an oval shape. Those bits are already designated to go. Have you seen any images that show these protruding buildings? Have you seen anything from AT saying they wish to lift the designation? That’s a holdover from the late 90s scheme. You’ll see it also covers things such as the church on Brentwood ave where the light rail was going to join onto the western line. Ancient history. You can find the similar things on Mt Eden Road, among other places. Some other great humdingers left in like the designation for the eastern motorway through Meadowbank. If you look at the renders of the current scheme, they don’t demolish any buildings. Growth areas? So the 1000’s of homes in Mt Roskill and Mangere isn’t growth…there is more to growth than outwards. So the 1000’s of homes planned for Mangere and Mt Roskill isn’t classed as growth areas? There is more to Auckland growing than just growing outwards. Those arterial roads are in the wrong place. Leave out that new proposed arterial. The state highway should follow that route around the town centre. Then we can have a more or less car free town centre. If we’re building a new satellite town in paddocks we may just as well do it properly. Billions of dollars we’re paying for infrastructure for this sprawl. And the travel it’ll induce will contribute to further congestion and to further ratrunning and DSI. We’re literally paying for this in our rates and in tithing our loved ones to the system. Would all be better spent on providing housing on carparks in the isthmus, and on whatever work the infrastructure needs there. You can’t tell me it’s faster to provide homes by doing it this way. It’s all just more vkt and carbon emissions… even if they got the location of the station right. It’ll never be as good as enabling intensification. Maybe we could do both and let people vote with their feet. It would mean staging the infrastructure and only building what was actually needed at both. Trouble with leaving it to the market like that, miffy, is that putting all the costs of driving onto the people driving is even more difficult politically than getting on with intensification. And does have equity issues when we’ve had 60 years of subsidising sprawl. Presumably it would make some sense to position any car parks on the actual flood plain, rather than housing? Easier to move the cars when it rains, than the houses…? May not seem like standard practice, but due to the Motorway severance & other reasons I can’t help but think in this situation we should actually build two rail stations the one Matt suggested slightly SW of the proposed Drury West one & the other NE one but slightly higher up but near the existing Drury Village, north of Waihoehoe Rd. This distance is actually approx 2.5kms. Further than say between Papatoetoe Puhinui (~1.5kms). May cost more but so much nicer mode & one could be built then the other to match the staged development order which ever way it is. oh just read the proper document and two is what they recommend. Confused with the original options. Looking at the map, there are opportunities to use those streams and flood plains. They could build walking and cycle ways along the streams, with landscaping, and local playgrounds. They could also use the flood plain as local reserve and build a boardwalk on top of it. Disconnected streams will be joined together to form a network. The center of the network will be the train station and town center. The advantage of it is that walking network is distant from arterial road. The quality of the walking will encourage active mode making the whole area more livable. Council seems to be happy to be hands off about such things. I high doubt the developers use their private land to build public amenities. Even if some developers want to build some nice walking connections, the other developers may not. So we end up with a useless cue-de-sac disjoint walking network that goes nowhere. Will the new roads in the residential areas be mandated as a grid, so that it is easier to run buses through them after it is decided later that PT would be good? Just came back from Manukau city on the 380 electric bus very nice. I could here the regen kick in as it slowed down. Its painted yellow orange just like the diesel ones. Looks brand new. Bring them on and bring on the hybrid battery EMU’s to run to Dury. We can’t wait for the bureaucrats at NZTA and AT to extend the electrification to Pukekohe. How did they get in control if politicians from both Labour and National can promise to electrify the track why can’t it get done. Council require developers to keep streams, revegetate good widths and provide an off-road linked cycling- ped network through all the streams areas through to any centres. Its the vagueness about the Mill Rd corridor location that’s the problem, it causes such severance.